I got a call one day from a past client who was urgently trying to get a hold of me. 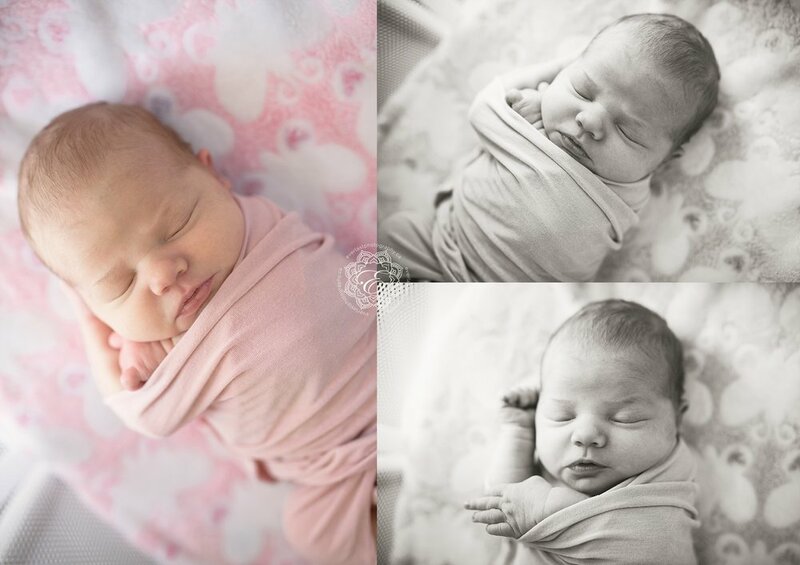 She had a long-time friend who was in need of newborn portraits, but was on a very tight deadline. You see, baby Elsie was less than a week old. When Mom was pregnant, they discovered that Elsie had a condition that would require an immediate procedure once she was born. However, her parents weren't sure if they would be flying out to Montreal or driving from Fort McMurray all the way to Edmonton, Alberta for her procedure and appointments. Once Elsie was born, the whole family moved to a temporary home in Edmonton so that they could regularly attend their appointments at the Stollery and receive the best care possible for baby Elsie. That is when I got the call. Because of all the unknowns with their circumstances, they weren't able to book a portrait session in advance. They had only arrived one day prior, but with their doctor's appointment booked the following day, there was a very short time frame in which they would be able to have these memories captured forever. Once Elsie's procedure was done, she wouldn't be able to pose for any sort of newborn portraits. I arrived to their condo with all of my equipment and a few basic things to use for their photos. Mom and Dad were concerned that they didn't have the appropriate clothing for their photos because in all the rush, they didn't think to pack for this. I assured them that what is most important is that they are in these images with Elsie and that when their daughter is older she can look back on these special first days with her parents (and puppy!). We were able to use the beautiful afternoon light coming in through the window to capture some pretty and timeless images of each parent with Elsie. And, I was able to capture all of baby's details too, which was very important to Mom. I followed up with Elsie's parents after their session to ask how her procedure went. I was so pleasantly surprised to hear that her condition wasn't as severe as the Doctor's were expecting and she didn't even need to have the procedure done at all! No one could have asked for a better outcome! This changed everything for this family, and especially for Elsie! The whole family is already back in Fort McMurray now, enjoying their home and their special moments as a family. Please feel free to leave some love for this amazing family in the comment section below! I know Elsie and her family would love that.